Picture - Although it was considered a failure, it provided technological insight. Primary user: Luftwaffe was planned user. 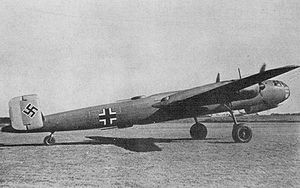 The Focke-Wulf Fw 191 was a prototype German bomber of World War II. Two versions were intended to be produced, a twin-engine version using the Junkers Jumo 222 engine and a four-engine variant which was to have used the smaller Daimler-Benz DB 605 engine. The project was eventually abandoned due to technical difficulties with the engines. Dipl. 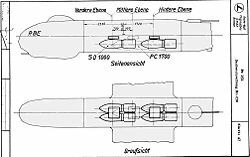 Ing E. Kx�sel, who also worked on the Fw 189 reconnaissance plane, was supposed to have led the design team for the Fw 191. Overall, the Fw 191 was a clean, all-metal aircraft that featured a shoulder-mounted wing. Two 24-cylinder Jumo 222 engines (which showed more promise than the DB 604 engines) were mounted in nacelles on the wings. An interesting feature was the inclusion of the Multhopp-Klappe, an ingenious form of combined landing flap and dive brake, which was developed by Hans Multhopp. The entire fuel supply was carried in five tanks located above the internal bomb bay, and in two tanks in the wing between the engine nacelles and fuselage. The tail section was of a twin fins and rudders design, with the tailplane having a small amount of dihedral. The main landing gear legs retracted to the rear and rotated 90� to lie flat in each engine nacelle, much like the main gear on the production versions of the Ju 88 already did. Also, the tailwheel retracted forwards into the fuselage. A crew of four sat in the pressurized cockpit, and a large Plexiglas dome was provided for the navigator; the radio operator could also use this dome to aim the remotely-controlled rear guns. At this point, the RLM allowed the redesign and removal of the electric motors (to be replaced by the standard hydraulics), so the Fw 191 V3, V4 and V5 were abandoned. The Fw 191 V6 was then modified to the new design, and also a pair of specially prepared Jumo 222 engines were fitted that developed 1,641 kW (2,200 hp) for takeoff. The first flight of the new Fw 191 took place in December 1942 with Flugkapitx�n Hans Sander at the controls. Although the V6 flew better, the Jumo 222 were still not producing their design power, and the whole Jumo 222 development prospect was looking bad due to the shortage of special metals for it. The Fw 191 V6 was to have been the prototype for the Fw 191A series. The V7 through V12 machines were abandoned in favor of using the Fw 191 V13 to install a pair of Daimler Benz DB 606 or 610 engines, which were basically coupled pairs of either DB 601 or 605 12-cylinder engines. Their lower power-to-weight ratio, however, meant that the armament and payload would have to be reduced. It had already been decided to delete the engine nacelle gun turrets, and to make the rest manually operated. Five more prototypes were planned with the new engine arrangement, V14 through V18, but none were ever built.